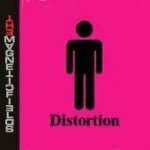 If you came late to the Magnetic Fields party, as I did with 69 Love Songs, you are probably going to be a little taken aback by the shear sonic disturbance of the aptly named Distortion. Think of the former album’s When My Boy Walks Down the Street, and you’ll get an idea of the latter’s metallic mélange. It’s a deliberate rip of the Jesus and Mary Chain, the band that took the 80’s cavernous reverb aesthetic to its ultimate heights. I’ve already made my disdain for the sound of that musically miserable decade plain in article after article reviewing the bands that suckled at its teet in younger, happier times. To reiterate, it’s too harsh, indistinct, tinny and emotionally distant. So I was definitely not predisposed to enjoy Stephin Merritt’s latest conceptual coup. That being said, Merritt is a songwriter par excellence in the classical mode. He usually marries witty lyrics to songs that take shape in instantly recognizable forms, with melodies that score high on the hummable index. The songs on Distortion are no exception. Who else could start a song, “Sober, life is a prison/Shitfaced, life is a blessing”? And who else could call it brilliantly, Too Drunk to Dream, a title whose alliteration I seem to have adopted in this review? Merritt’s deadpan baritone shouting out lines like “I’ve got to get, too pissed to miss you” is as clever and funny as anything in the rock canon. Or how about The Nun’s Litany, where a frustrated wife of Jesus lists the ways she’d like to take off her clothes and whip her lovers? Is it just wishful thinking that it sounds as true as it is heretical? The fact is there are just too many smart, well-written songs on this album to get hung up on the messy sound. Zombie Boy has a hook that could, pardon me, wake the dead. And it’s a good thing that Merritt is gay, because he’d have a hard time picking up chicks after having written that he hates California Girls, now that he’s apparently moved there from his home base in NYC. Not every song is a gem, but his hit to miss ratio is about what it was on Love Songs, which is pretty remarkable anyway. In the end, the concepts he builds his albums around seem less essential as unifying themes than as a steady framework whereupon he can construct his set pieces. Maybe this sounds contrived to you, but it’s hard to deny that it works for him. Distortion is yet another prime example, and I really like it despite myself.